On April 12, former President Mahmoud Ahmadinejad shocked Iranians when he registered for the presidential election. The Guardian Council, which is responsible for vetting all potential candidates, may or may not let him run, but his decision alone openly defied the supreme leader. 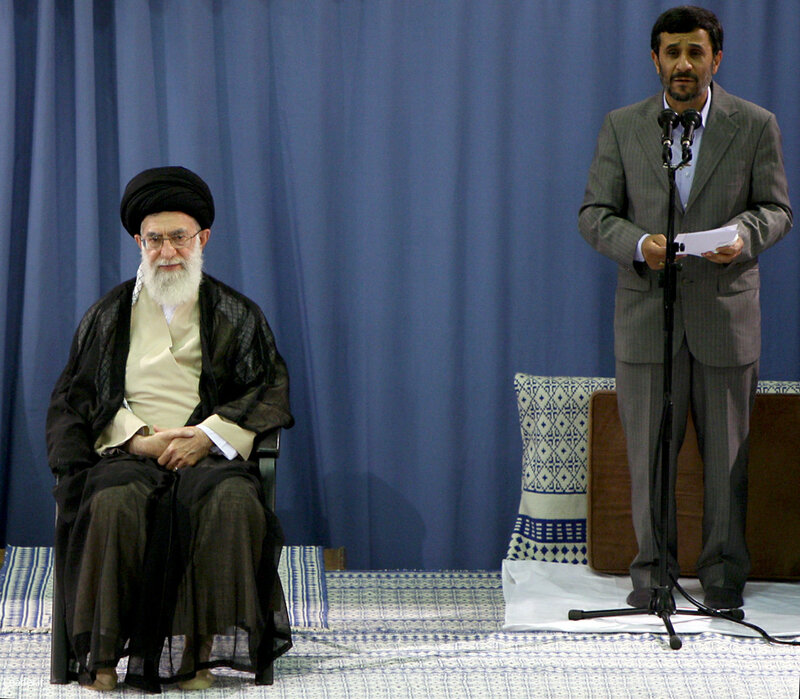 In September 2016, Ayatollah Ali Khamenei advised Ahmadinejad not to stand for election again. “It will create bipolar opposites and divisions in the country which I believe is harmful," the supreme leader said. Ahmadinejad was president for two terms between 2005 and 2013. It was not Khamenei’s first rebuke of Ahmadinejad. Their relationship began fraying during Ahmadinejad’s first term as president. The populist often broke ranks with mainstream conservatives, angered clerics with his messianic views and attempted to gain additional power within the political system. Khamenei stepped in several times to restrain him. **Update: The Guardian Council ended up blocking Ahmadinejad and his protégé, Hamid Baghaei, from running for president in the 2017 election. Click here for profiles of the approved candidates. The following is a chronological rundown of tensions between the Khamenei and Ahmadinejad. Ahmadinejad won the 2005 presidential election with the support of conservatives and the security services. A former mayor of Tehran, he was also widely viewed – at the time – as a counter to the clerics and less corrupt. 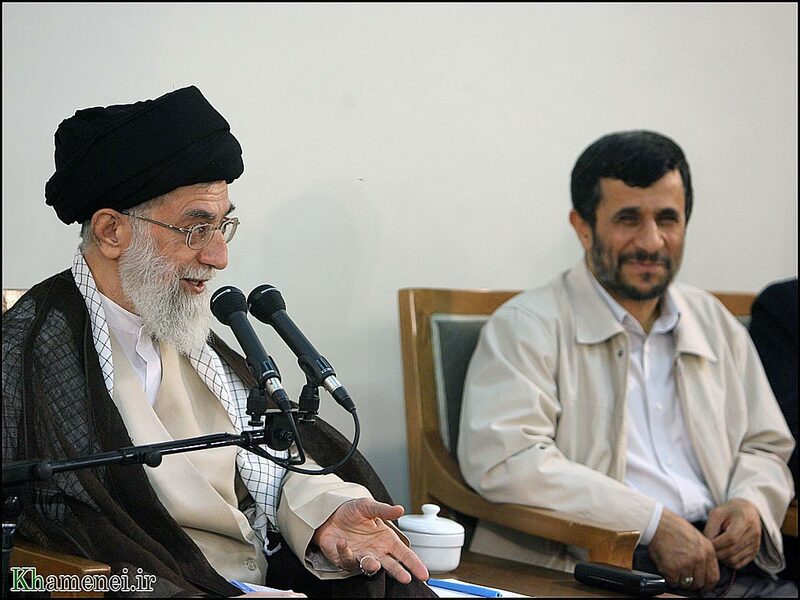 In public speeches, Khamenei openly supported Ahmadinejad for the first two years of his presidency. But his confidence appeared to wane as the populist president’s economic policies produced rampant inflation of basic necessities. Khamenei’s differences with Ahmadinejad initially involved personnel choices. In late 2007, Ahmadinejad dismissed his interior minister, Mohammad Zolghadr. Khamenei soon countered by appointing Zolghadr deputy head of the Basij militia. In January 2008, Khamenei challenged Ahmadinejad’s policies. “The government has certain unique characteristics, but like any other government there are mistakes and shortcomings," he said in Yazd. Later in January, Khamenei sided with Parliament against Ahmadinejad on legislation ordering the government to supply cheap gas to villages facing power cuts during an unexpectedly harsh winter that killed dozens of people. The president refused to comply, arguing that Parliament had overstepped its authority. The supreme leader then intervened. "All legal legislation that has gone through [the required] procedures stipulated in the constitution is binding for all branches of power,” Khamenei wrote Parliament. The president was forced to comply. In the spring of 2009, a flap developed over the personnel and office responsible for running the Hajj pilgrimage. It was normally run out of the supreme leader’s office by Mostafa Khaksar Qahroudi. The Ahmadinejad government dismissed Qahroudi and moved responsibility to a tourism committee. Khamenei again publicly rebuked Ahmadinejad. "The president was strongly notified that the annexation of this organization to the tourism committee is not appropriate," he said. Khamenei ordered that Qahroudi be reinstated. During the 2009 presidential campaign, Ahmadinejad seemed to anger Khamenei again. Ahmadinejad accused several current and former officials of corruption and linked them to his chief rival, Mir Hossein Mousavi. During a heated television debate, Ahmadinejad even accused Mousavi’s wife of gaining two degrees illegally and beginning doctoral work without taking a university entrance exam. "One doesn't like to see a nominee, for the sake of proving himself, seeking to negate somebody else," Khamenei said in a speech. "I have no problem with debate, dialogue and criticism, but these debates must take place within a religious framework." Ahmadinejad won the 2009 poll, but millions of people protested the vote in public demonstrations. Khamenei initially backed Ahmadinejad. He allowed security forces to crack down brutally on demonstrators. In a public speech, he also shared Ahmadinejad’s foreign policy. The détente did not last long, however. Khamenei intervened over another appointment. Ahmadinejad named Esfandir Rahim Mashaei (left), a close friend and the father of his daughter-in-law, to be his first vice president. Mashaei was a controversial figure who had angered hardliners and clerics while heading the government’s organization for tourist affairs. Khamenei ordered Ahmadinejad to fire Mashaei. 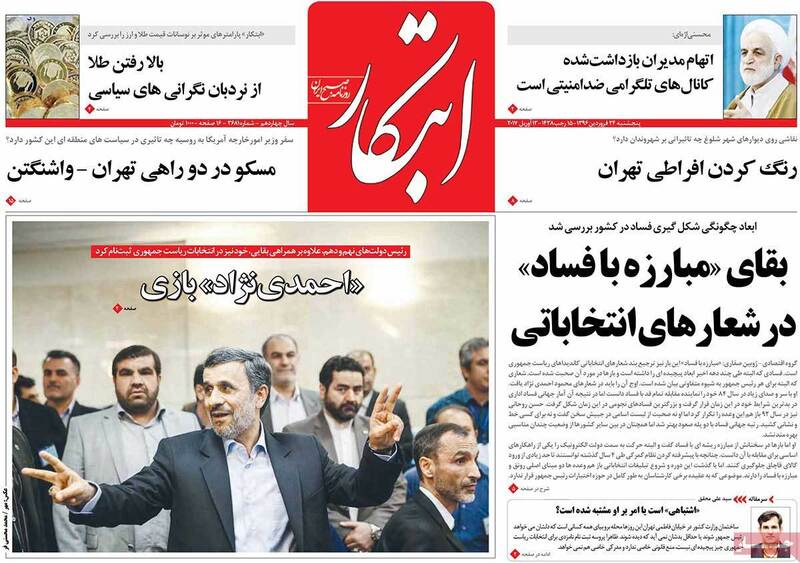 The president complied, but then made Mashaei his chief of staff. The real turning point in the relationship played out during the second term over Ahmadinejad’s intelligence minister—a position that normally requires the supreme leader’s implicit approval. In April 2011, Ahmadinejad forced Heydar Moslehi to resign after discovery that the office of Mashaei, his chief of staff, had been bugged. The intelligence minister had also fired a friend of Mashaei from a government position. When Moslehi refused to resign, Ahmadinejad tried to demote him. Khamenei then reinstated Moslehi in a public letter to the president’s office. In response, Ahmadinejad boycotted cabinet meetings and other official functions for almost two weeks. The supreme leader reportedly ordered the president to accept the reinstatement or resign the presidency. Ahmadinejad then began reporting for work. The row opened Ahmadinejad up to wider criticism by conservative politicians and clerics who had largely remained silent. Ahmadinejad again appeared to anger Khamenei in February 2013. The president exposed a secret tape of Fazel Larijani—the brother of Parliamentary Speaker Ali Larijani—trying to leverage his family’s political influence for economic gain. Ahmadinejad accused the Larijani family of corruption and called the judiciary, headed by another Larijani brother, a “family institution.” All five Larijani brothers have held key positions in the Islamic Republic. The family is close to Khamenei, who has appointed three of the five brothers to senior positions. During the last two years of Ahmadinejad’s presidency, his inner circle came to be known as the “deviationist current.” His position was weakened after the arrest of several aides for sorcery or corruption. Clerics also condemned Ahmadinejad and allies for predicting that imminent return of the Twelfth Imam, a messianic figure known as the Mahdi. After leaving office, Ahmadinejad maintained a low profile for three years. In mid-2016, he began giving campaign-like speeches across the country. He criticized the current government’s economic and foreign policies. In September 2016, Khamenei sought to preempt his comeback by telling him privately not to run. In a subsequent speech, the supreme leader said publicly, “I didn’t tell him not to participate, I told him I won’t recommend him participating” because Ahmadinejad would be too divisive as a candidate. Ahmadinejad then sent a letter to Khamenei saying that he would respect his request. Ahmadinejad stunned the political establishment in April 2017 by announcing he would, indeed, run again. He initially said he would support Hamid Baghaei, one of his former vice presidents. But when Ahmadinejad accompanied his protégé to register to run, he signed up too--without further explanation. The former president appeared to be seeking a comeback, either by returning to office or through a proxy, or by gaming the vetting process. 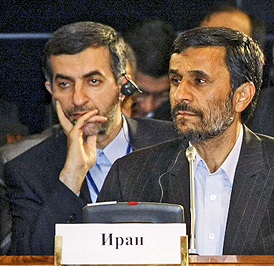 Ahmadinejad may have been signaling that the Guardian Council must allow Baghaei to run if it did not want him to compete. In the end, the council rejected both men’s candidacy.